Here, we create a map without radar data to concentrate on the other layers. Here we - read the DEM via wradlib.io.open_raster and extracted via wradlib.georef.extract_raster_dataset. - resample the data to a (lon/lat) grid with spacing=0.005. Note: we organise the code in functions which we can re-use in this notebook. For country borders, we use ESRI Shapfiles from Natural Earth Data. We extract features using - the OGR.Layer AttributeFilter and - the wradlib.georef.get_vector_coordinates function. The plot overlay is done via wradlib.vis.add_lines. 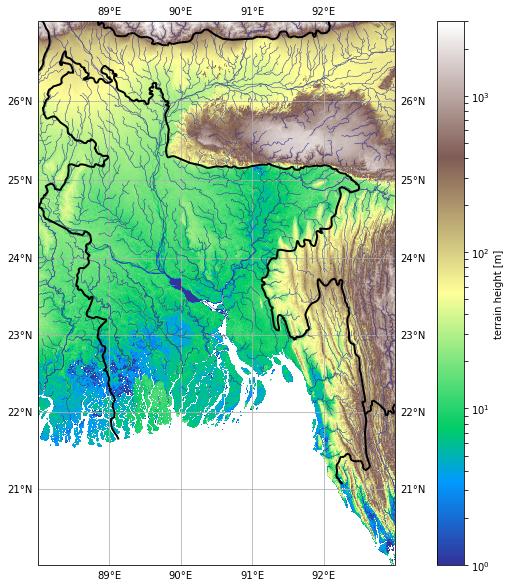 For rivers, we use ESRI Shapfiles from FAO and Natural Earth Data. We extract features using - the OGR.Layer SpatialFilter and - the wradlib.georef.get_vector_coordinates function. Then we use wradlib.vis.add_lines again for the overlay. 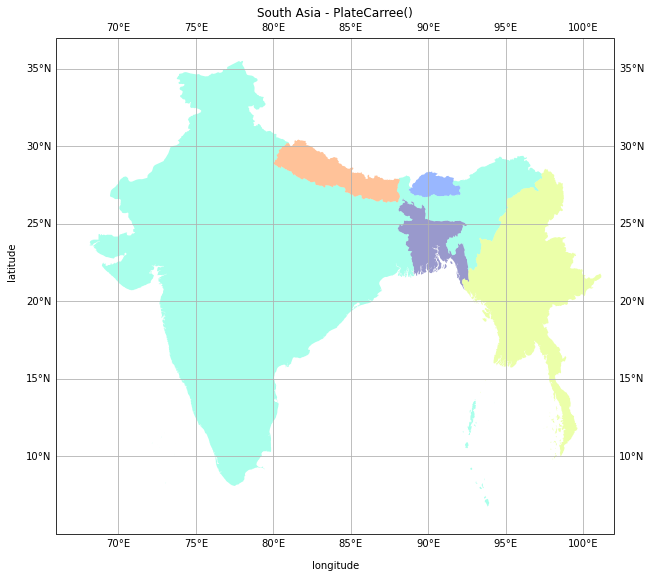 The 5 biggest cities of bangladesh are added using simple matplotlib functions. 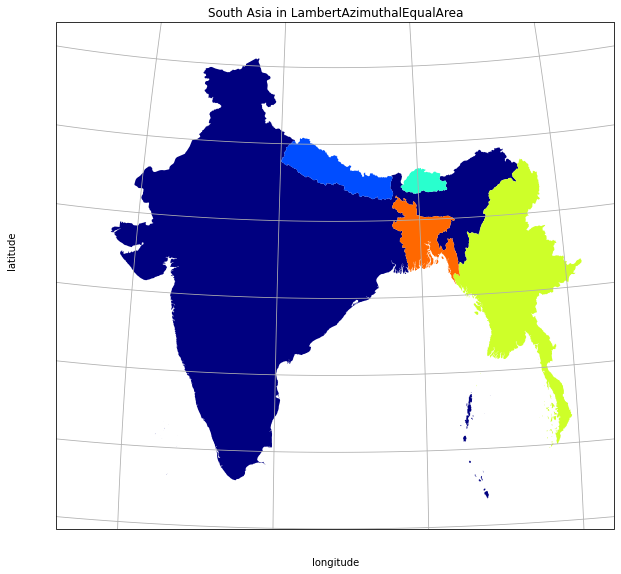 Here, we plot countries as patches on a lat/lon (WGS84) map (data from Natural Earth Data again). We again extract the features using - the OGR.Layer SpatialFilter and - wradlib.georef.get_vector_coordinates. Then the patches are added one by one via wradlib.vis.add_patches. # why comes the US in here? Here, we plot countries as patches on a projected map. We extract the features using - the OGR.Layer AttributeFilter and - the wradlib.georef.get_vector_coordinates function. The coordinates of the features are reprojected on the fly using the dest_srs keyword of wradlib.georef.get_vector_coordinates. Then, the patches are added to the map via wradlib.vis.add_patches. fattr = "name = '" + item + "'"